Mac Audio Toolbox is an audio function generator for the Macintosh. Using no additional hardware, you can produce sine, square, triangle, and sawtooth waveforms of any frequency up to 22 kHz, as well as generate noise - both pink and white.Mac Audio Toolbox can be used to create all sorts of cool sound effects. You have full control over the frequency, type and volume of each sound produced.In addition, there is a sweep generator. 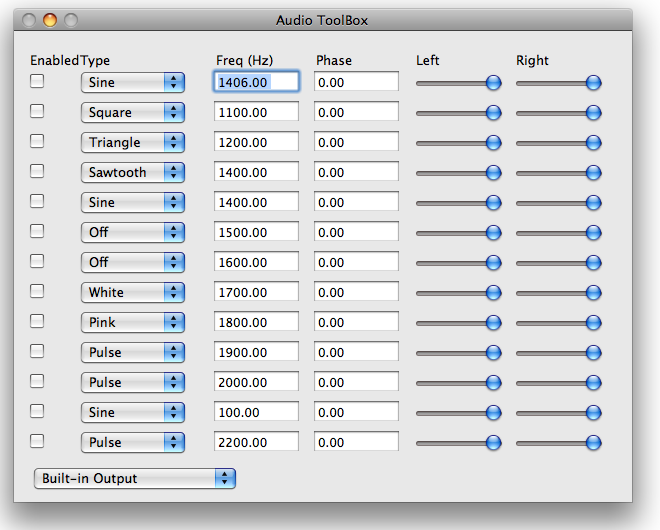 Mac Audio Toolbox is an audio function generator for the Macintosh. You can generate up to 13 different waveforms. Each waveform can be routed to either the left or right channel, or to both. The amplitude of each waveform may be adjusted, as well as the volume on each channel, which is a mix of any waveforms routed to that channel. The settings of all 13 waveforms can be controlled via AppleScript. In addition, there is a sweep generator. Super for producing "Whoop Whoop" sounds, sirens, and more. You can also save the audio you create to an AIFF file for further use, or for burning on a CD. Qweas is providing links to Audio Toolbox for Mac 2.0.2 as a courtesy, and makes no representations regarding Audio Toolbox for Mac or any other applications or any information related thereto. Any questions, complaints or claims regarding this application Audio Toolbox for Mac 2.0.2 must be directed to the appropriate software vendor. You may click the publisher link of Audio Toolbox for Mac on the top of this page to get more details about the vendor.